California Theme Parks. Limousine Service to Six Flags, Great America, and More. San Francisco Limo can take you to Northern California's most spectacular theme parks, both within the Bay Area and less than an hour from San Francisco! Forget about traffic, parking, and all the other hassles, as we handle all the transportation for your fun-filled journey. Whether you're looking for a day the whole family can enjoy or you're taking a special party to your favorite Northern California theme park, booking limousine service for that special day will make everything more memorable. 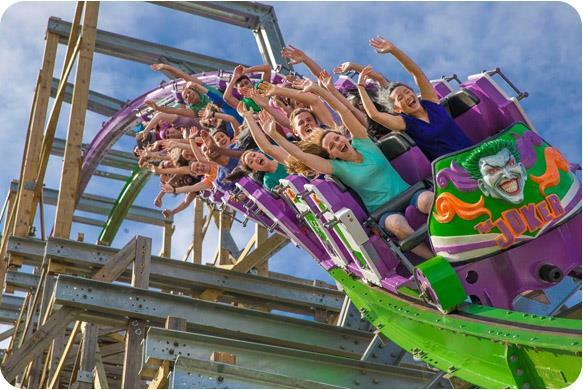 Both Paramount's Great America and Six Flags Marine World have recently installed cutting-edge rides that can take you over 70 miles per hour, pushing the envelope of theme park excitement even further. Of course, there's also plenty of entertainment for the whole family to enjoy, and the excitement and luxury of a limousine ride only adds to it! Imagine being able to enjoy everything Paramount Great America and Six Flags Marine World have to offer, without having to endure your own traffic-filled roller-coaster drive back home. With your own private San Francisco limousine, you can kick back, relax, and savor the anticipation or the memories of an unforgettable day, at the Bay Area's most reasonable limo service rates. San Francisco Limo is your choice for Bay Area luxury transportation services and transfer arrangements of all kinds. For business clients or guests coming to San Francisco, we are just what you need for reliability and value.